Linda Hogan grew up in a military family and therefore moved often. As a result, she did not grow up within an Indian community (her tribal affiliation is Chickasaw). Most of her childhood was spent in Oklahoma and Colorado. Linda was a professor in the English Dept. at the University of Colorado in Boulder, where she received her M.A. in 1978. She has served on the National Endowment for the Arts poetry panel for two years and has been involved in wildlife rehabilitation as a volunteer. The main focus and movement of Linda's work concerns the traditional indigenous view of and relationship to the land, animals and plants. Deer Dance, a previously unpublished poem. Linda has recently received a 2002 Wordcraft Circle Writer of the Year Creative Prose: Memoir for The Woman Who Watches Over The World: A Native Memoir. In July 1998, she received the Lifetime Achievement Award from the Native Writers' Circle of the Americas. Linda received the American Book Award from the Before Columbus Foundation in 1986 for Seeing Through the Sun . 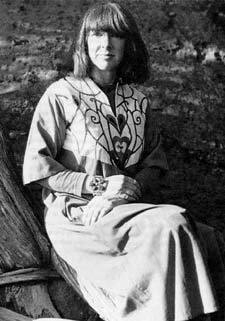 She received the Colorado Book Award in 1993 for The Book of Medicines , and in 1996 for Solar Storms . In 1994, Linda received the prestigious Lannan Award, which may not be applied for, for outstanding achievement in poetry. She has also received a Guggenheim grant, a fellowship from the National Endowment for the Arts, the Oklahoma Book Award for fiction in 1991 for her novel Mean Spirit , a Mountains and Plains Booksellers Award for fiction, a Pushcart Prize, the D'Arcy McNickle Tribal Historian Fellowship by the Newberry Library, Chicago, and the Five Civilized Tribes Museum Playwriting Award. The Book of Medicines was a finalist for the National Book Critics Circle Award in 1994. Mean Spirit was one of three finalists for the Pulitzer in 1990. Hogan has also been honored with the Outstanding Young Woman of the Year Award, for Community Service in 1980. Linda's short story Aunt Moon's Young Man was featured in Best American Short Stories (1989). The Book of Medicines : Poems , Coffeehouse Press. Red Clay : Poems and Stories , Greenfield Review Press. Seeing Through the Sun (Juniper Prize), Univ of Massachusetts Press. Calling Myself Home , Greenfield Review Press, N.Y. 1979, 2nd Edition 1982. Daughters, I Love You , Loretto Heights Monograph Series, Denver, CO, 1981. Sightings: The Gray Whales' Mysterious Journey , with Brenda Peterson, National Geographic Society. A review of Solar Storms in the New York Times Book Review online edition. with Carol Bruchac and Judith McDaniel, Greenfield Review Press. A Piece of Moon , Produced Fall 1981, Okla. State University. Everything Has a Spirit , narrative for video which has shown on PBS. Ishmael Reed (Editor), Thunder's Mouth Press. Women and God , Linda Hogan, Brenda Peterson (Editors), North Point Press. Visit Teepee Town : Native Writings After the Detours , Diane Glancy, Mark Nowak (Editors), Coffeehouse Press. Jim Daniels (Editor), Wayne State Univ. Press. Janine Canan (Editor), Crossing Press. John Gattuso (Editor), Beyond Words Publishing Co.
Song of the Turtle : American Indian Fiction 1974-1994 , Paula Gunn Allen (Editor), Ballantine Books. Walking the Twilight : Women Writers of the Southwest , Kathryn Wilder (Editor), Northland Pub. American Nature Writing 1994 , John A. Murray, Editor, Sierra Club Books. From the Center of Tradition: Critical Perspectives on Linda Hogan , Barbara J. Cook (Editor), Univ. Colorado Press. This Story is Brimming Around: An Interview with Linda Hogan, Carol Miller, ASAIL, V 2, No. 4. The Writer on Her Work , Janet Sternberg, Editor, Norton. Derrick Jensen, Editor, Sierra Club Books. This is an "official" site in that this page was constructed with the assistance and active collaboration of the poet, Linda Hogan. The website "author" is Karen M. Strom. © 1997 Linda Hogan and Karen Strom.